I don't know about you but I hear someone say that and instantly I picture the Lone Ranger from my childhood on top of his loyal white horse rearing up to the sky. Many a nights, I would dream of the Lone Ranger and Tonto. When I heard that Disney was remaking my childhood memories, I was kind of nervous that they would ruin it! I got a chance to sneak preview the new Lone Ranger this week for Media Night. Going in expecting the worst and hoping for the best. The story kept me enthralled from beginning to end and laughing at almost ever scene! We cheered for the good guys and booed the bad! The action was great with quite a few references to the original show while bringing a new life into old memories. 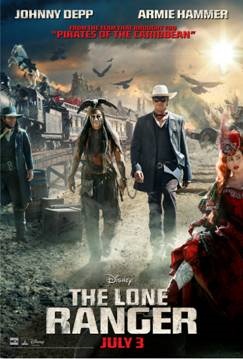 My favorite part of the movie was when the Lone Ranger officially became his character and the action started. The original theme song introduced him. It really brought chills down my body with the memories that accompanied the music! Any Johnny Depp fans can appreciate his role as Tonto, the Lone Ranger's mostly faithful friend. You can see some of his old personalities in a new character. You will love it especially if you enjoyed The Pirates of the Carribean. I have not had the pleasure of seeing Armie Hammer in another movie before but he was a good choice for this character(Lone Ranger). He also was easy on the eyes as well. While this movie of cowboys and Indians and taming the wild west with the Iron Horse(trains). The East and West come together with a new twist! I highly recommend this movie... to families 10+. I think the innuendos and violence might be too much for some of the younger audiences. I would not take my 4 and 6 year old to see it but mine are overly sensitive to "bad guys". If you are unsure about if the movie is appropriate for your children, I recommend watching it before bringing your children. While there are no direct R rated scenes, there are a scenes where violence is implied. An example of this is when the bad guy implies that he cuts out a mans heart and eats it. While the cutting is not showed, it does show that his face is bloody from eating. DISCLAIMER: I received tickets to preview this movie during a media night, before the public. I did not receive any other compensation. Do not use any pictures without permission.